Let bechamel cool 10 minutes, then whisk in cheese, Dijon mustard, Worcestershire sauce, and cayenne. Cover cheese sauce and keep warm. Preheat oven to 450 degrees. On a rimmed baking sheet, toss cauliflower, with extra-virgin olive oil; season with coarse salt and ground pepper. Roast until tender but not mushy, 20 minutes, stirring halfway through. 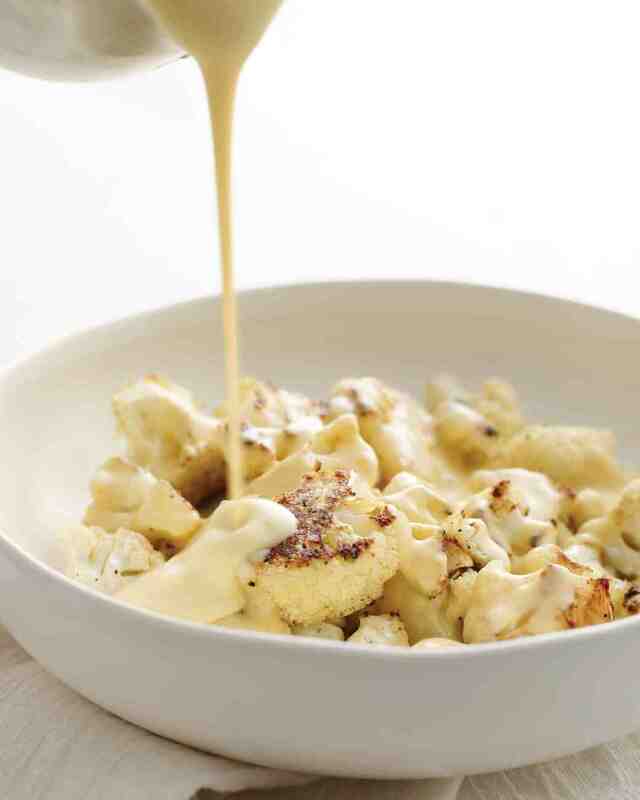 Serve cauliflower topped with cheese sauce. In a medium saucepan, melt butter over medium. Add onion and garlic; cook until onion is soft, 4 minutes. Add flour, season with salt, and cook, stirring, until mixture is pale golden with a nutty aroma, 4 minutes. Whisking constantly, add half the milk. Add the remaining milk and whisk until smooth. Cook, whisking constantly, until sauce comes to a boil and thickens, 10 minutes. Use immediately.